SO, TELL ME ABOUT YOURSELF.. 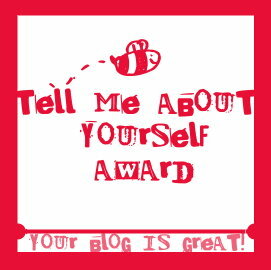 I was awarded the 'Tell Me About Yourself Award' by Sam from LIL MIS BUTTERCUP. Her blog's lovely so, do check it out! - I am a total girly girl. - My favourite sport is tennis. - I love designing clothes. - I own two cats and a yorkshire terrier, Scruffy. - One of my all time favourite movies is Legally Blonde. - I am a subscriber of Teen Vogue, and eventually, I hope to start subscribing to Vogue too. - My favourite tv shows are Gossip Girl and 90210. Thank you Hannah! Great blog, yourself. Thanks so much. That is very kind of you. Would you mind if I don't do post about it right away? My college is kind of hectic and my blog is suffering because of that. Your all welcome! And Maya, it took me a few days to get my post about it up so I'm sure it's fine!